Look at this certified 2015 Ford Edge SE. Its Automatic transmission and Intercooled Turbo Premium Unleaded I-4 2.0 L/122 engine will keep you going. This Edge has the following options: Wireless Streaming, Wireless Phone Connectivity, Wheels: 18" Aluminum Painted Sparkle Silver, Vinyl Door Trim Insert, Trip Computer, Transmission: 6-Speed Automatic -inc: paddle shifters, Transmission w/Driver Selectable Mode, Tires: P245/60R18 AS BSW, Tire Specific Low Tire Pressure Warning, and Tailgate/Rear Door Lock Included w/Power Door Locks. 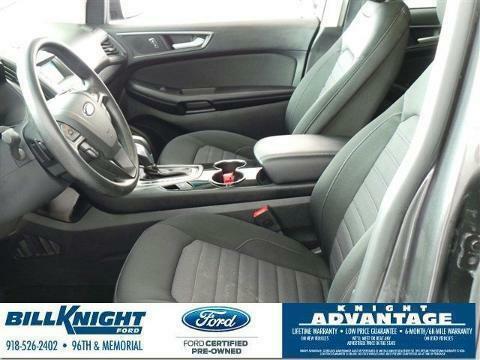 See it for yourself at Bill Knight Ford, 9607 S Memorial Dr, Tulsa, OK 74133.